EXHIBIT: "Transformation: Sky and Water," recent paintings by Judy Hawkins. Furchgott Sourdiffe Gallery, Shelburne. Through May 9. Putney artist Judy Hawkins pursues two themes, one of which is water; Hawkins is a painter of clouds, rivers and reflections dancing over aquatic surfaces. Her second, less obvious, theme is the expressive power of painting. As she reinterprets the natural world, Hawkins paints with supreme confidence, a mature yet evolving personal aesthetic, and a total mastery of color. Several of the 18 Hawkins paintings now on view at the Furchgott Sourdiffe Gallery in Shelburne are veritable kaleidoscopes. Nature is a point of departure in Hawkins' best works. But in a few others, such as "Morning Mist," the landscape seems like little more than a motif. The most conservative landscape in the show, Hawkins' 30-by-24-inch marshland morning, with scruffy brown grasses, gray skies and silvery water, is virtually colorlessin both senses of the word. But its excessive circumspection sets it apart. While 36-by-24-inch "Evaporation" relies on a similar misty morning palette, it's in a dynamic composition of angled furrows, curving slightly over a subtle rise in the field at left. A triangle of dark values unfolds in the upper right of the horizontal piece. That chromatic distance between light and dark imparts a measure of drama that "Morning Mist" lacks. All of Hawkins paintings are structurally robust. When her colors become equally exciting, the paintings truly sing. The 2-by-2-foot square "River Setback" transitions from calm naturalistic hues to expressive warm colors in a topsy-turvy way. Naturalistic skies - cerulean blue and puffy white clouds - lounge as a placid reflection in the bottom third of the canvas, but as the eye travels upward to the sky itself, the local color gives way to dark turquoise, yellow green, and, ultimately, fiery reds and orange. As in "Evaporation," "River Setback" has a dark and murky upper right hand corner that provides stark contrast between light and dark values. Hawkins takes risks with hues and execution to the point of being idiosyncratic in several pieces that focus on rushing water. The results are superb. Her 24-by-30-inch oil "Wave" has foamy dots and curls of white, while squiggles of bright colors create a cacophony of brilliant hues. Warmer colors are located in the center of the canvas, as dark corners frame the wave. Hawkins' tumultuous waters seem influenced in equal measure by Asian landscapes and Post-Impressionism. If those are among her influences, however, both sources have been perfectly synchronized to invent a completely original personal approach. "Ripples and Splashes" has short squiggles of white floating over churning patches of red-orange and Prussian blue. 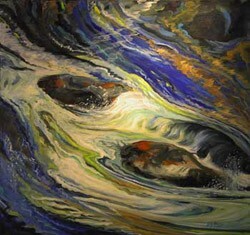 Hawkins painted the 24-by-30-inch work with distinct layers of color, giving her rapids wonderful depth. She also varies the intensity of her paint, with differing degrees of opacity in the way the colors are laid down. The 30-by-30 inch "Lauren's View" is in the same class of abstractions as "Ripples and Splashes" and "Wave," but several stones under the rapids shape the flow of their stream. Eddies and spray interact with the rocks, as water rushes upon them on all sides. Hawkins used variations of blue in designing the composition, but a few red patches on the nearly black stones impart calmness - a lack of movement - suggesting steady islands in the stream. If Hawkins is producing two bodies of work simultaneously - one as conservative as "Morning Mist" and the other as almost wholly abstract as "Ripples and Splashes" - it wouldn't be the first time an artist fished with two kinds of bait. There are no dates ascribed to the paintings, but in her artist's statement Hawkins notes: "My most recent paintings explore intimate views of water, trying to capture its multi-dimensions . . . from stream bottom through layers of water, to the surface tension, flow and water splashes, to reflections in the water." She adds, "There are endless possibilities." This show certainly proves that point.